Juventus has appeared to be unstoppable in Serie A this season after a 3-1 victory over 10-man Napoli. 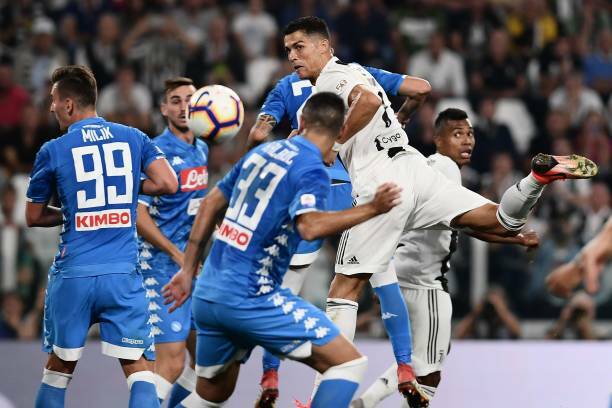 Napoli pushed Juventus all the way last season in the most exciting title race in recent history but Juventus grabbed the title despite being beaten at home by Napoli late in the campaign. Today, Napoli took only 10 minutes to take a deserved lead. Allan picked out Jose Callejon, who found Dries Mertens with a delightful volleyed pass and the Belgium international slotted home. Juventus leveled in the 26th as a great bit of skill from Ronaldo on the left saw him befuddle Elseid Hysaj and put in the perfect cross for a towering Mandzukic header. Juventus completed the turnaround four minutes after the break. Ronaldo's effort came off the left post and Mandzukic turned in the rebound. Napoli's night went from bad to worse in the 58th when defender Mario Rui was sent off for a second yellow card. Juventus capped the match 14 minutes from time. Ronaldo glancing header from a corner came to the far post where Bonucci was sliding in to score his first goal since his return from AC Milan in the offseason.